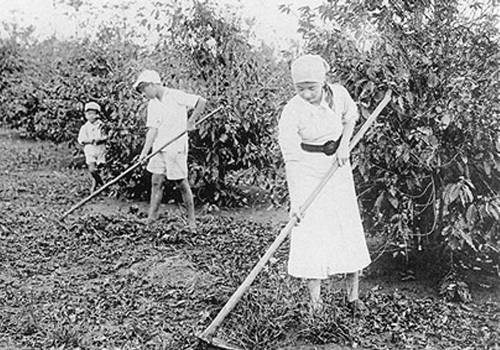 Between 1908 and the mid-1900s, about 200,000 Japanese migrants left behind poverty and unemployment in Japan to work on coffee plantations in Brazil. Today, Brazil has more than 1.5 million Japanese descendants – the most anywhere in the world outside Japan. In 1990, facing a shortage of factory workers, the Japanese government passed a law allowing second- and third-generation Japanese descendants and their families to live and work in Japan. Since then, hundreds of thousands of Brazilian families have gone to Japan in search of higher salaries and a better life. The documentary One Day We Arrived in Japan shows the stories of three of these families. * When and why did Japanese migrants go to Brazil? * Where in Brazil do Japanese descendants live? * Which Brazilians can go to Japan, and why? * What do employment agencies do for the Brazilian migrants? If you would like to show the film to your class and give your students access to watch it online, you may purchase an academic subscription, which includes access to the film as well as two additional migrant stories and four brief educational videos about Brazil-Japan migration. The subscription also includes the opportunity for your students to have a Q&A and discussion with the film’s producer and co-director (in person or via Skype, depending on location). The subscription, which is valid for a period of one year, costs $175 per school.